At their best, sports events showcase athletes approaching physical limits in thrilling and unexpected ways. 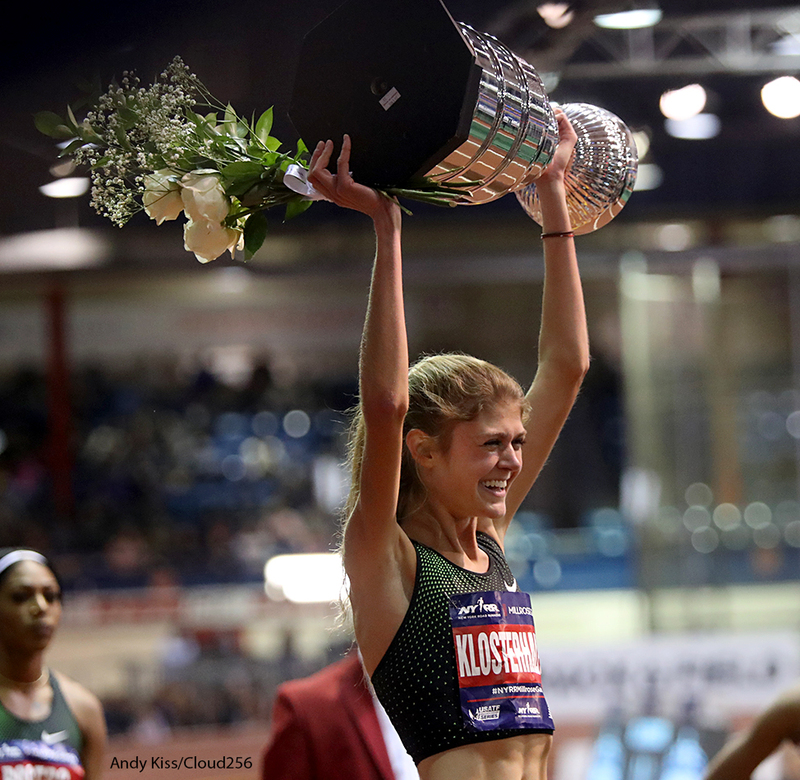 The NYRR Millrose Games once again did just that. 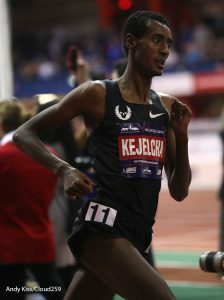 In the marquee races, Ethiopian Yomif Kejelcha barely missed the indoor mile world record and Germany’s Konstance Klosterhalfen won a daring race. But in a harrowing turn, the most dramatic event was one that left an athlete’s life in the balance. 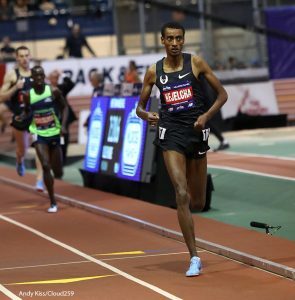 Kemoy Campbell, 28, who set the Jamaican national record for the 3000m at the 2016 Millrose Games, was rabbiting the 3000m on Saturday. Our photographer Andy and I were standing trackside when Campbell grimaced, slowed, and stumbled onto the infield in front of us. Two race officials attended the fallen runner and gestured to others on the infield for help. Campbell was unresponsive and the situation was worsening. Trackside spectators were stunned, one shouting “What’s going on?” One spectator was helped over the guardrail to get to the scene, another followed. 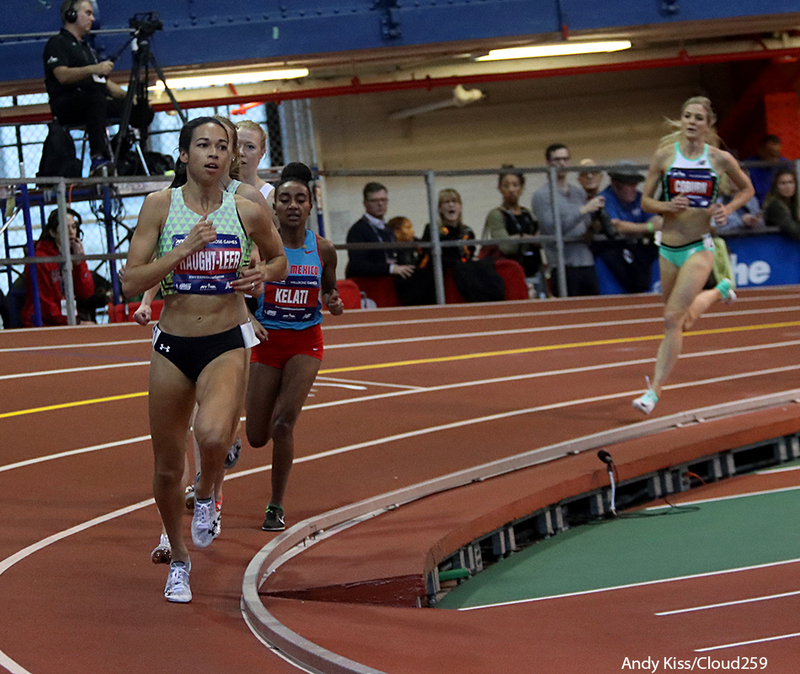 There is constant movement at the Millrose Games. High school athletes, spectators, and event coordinators mill around like commuters at a subway station at rush hour. Music amps the races. There’s plenty to look at, and many were likely unaware of the emergency. 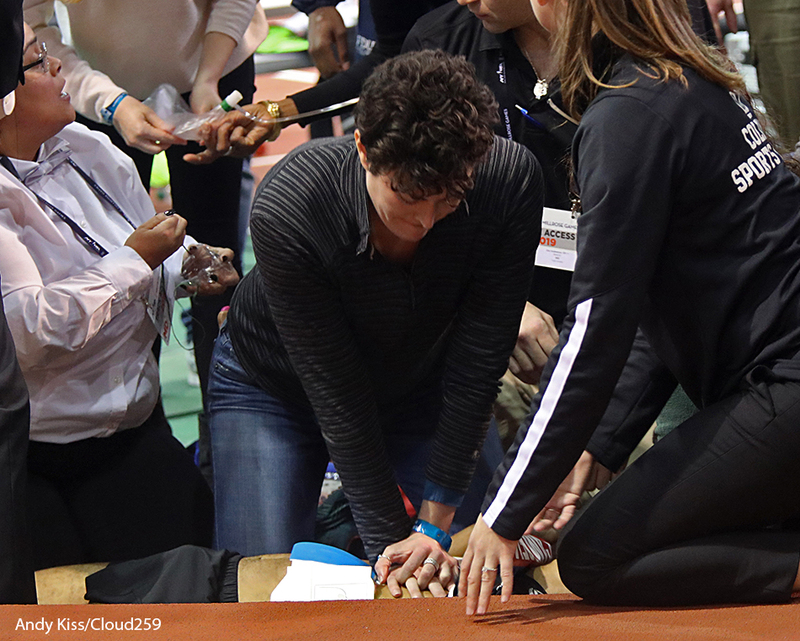 As 3000m runners continued racing around the track, Campbell was getting CPR on the infield. There was a smattering of applause when a witness said that Campbell was breathing. But he still seemed unconscious. The 3000m race, normally a thrilling, tension-building event for the distance geeks, mercifully ended. There was an announcement about the shot put, a choir of spectators in the balcony nearest the scene yelled in protest, and in short order organizers delayed the following events. Emergency workers surrounded the athlete. More time passed. Campbell, with an oxygen mask on his face, was taken on a stretcher to the hospital across the street. A football athlete, being carted off the field after a horrible collision, often gives a thumbs-up to assure the audience he is okay. Campbell was breathing and in good hands, but there was no such reassuring signal. 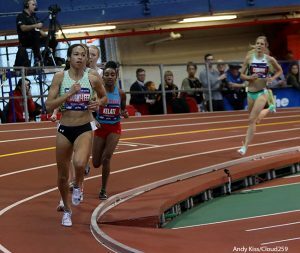 Unlike nearly all track events, the Millrose Games is nationally televised. To keep the Wanamaker Miles within that live televised window, the order of events was shuffled and the show went on. Some of the planet’s fastest women and men over the half mile and mile took the track. If aware of the medical emergency, perhaps they ran with more urgency still. Time is precious. Careers in the NFL are generally short, Tom Brady being the exception, not the rule, and the same is true in distance running. Keeping injuries at bay is a monumental challenge in both sports, and simply making a living is difficult for runners. Credit Will Leer, victor of the 2014 Wanamaker Mile in 3:52, for racing the “B” heat in the mile at Millrose. When Leer won the Wanamaker, his facial hair brought a bit of the wilderness to the race. Now clean shaven and representing UnderArmor, not Nike, Leer modestly ran near the back of the pack for the first half before moving out and moving up from seventh to first (excluding the rabbit) on the fifth lap. The tide turned, and Leer’s competitors rushed back over the last quarter. Amos Berlesmeyer ran 56 seconds for the last 400 and won in 3:59. Leer ran 59 and 4:02, for fifth. For an elite miler, five years is a long time, and for an elite mile so is ten seconds. Leer’s wife Aisha Praught-Leer attempted to defend her crown in the women’s 3000m after winning a three-way photo finish last year. 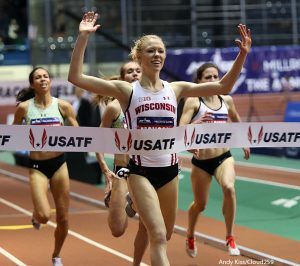 On the third lap Emma Coburn, who was second last year, and Elinor Purrier tumbled to the track, spotting the field three seconds. Now the race was on, the question being whether they could cover the gap, which takes calming the nerves and superior form and fitness to the competition. Mo did it at Rio in the 5,000, but it’s tough to be like Mo. 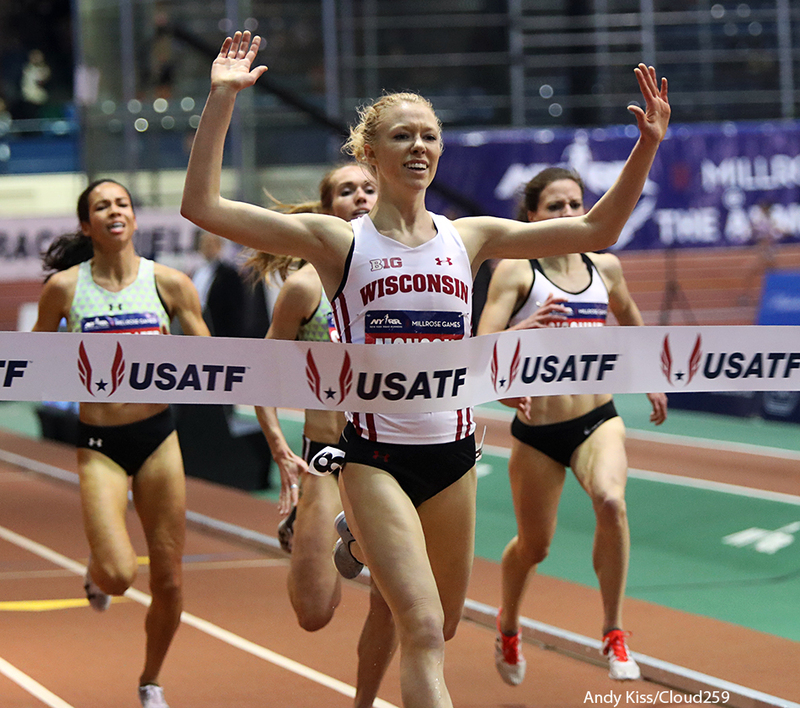 Praught-Leer, left alone to do the work in front, was unable to pull off another tight finish, as University of Wisconsin junior Alicia Monson ran the fastest last lap (31 seconds) for the surprise win (8:45). Another Badger, Australia’s Morgan McDonald, ran the fastest last lap of the men’s 3,000m, but Grant Fisher beat him to the line by a tenth of a second, both finishing in 7:42, in the race in which Campbell fell. 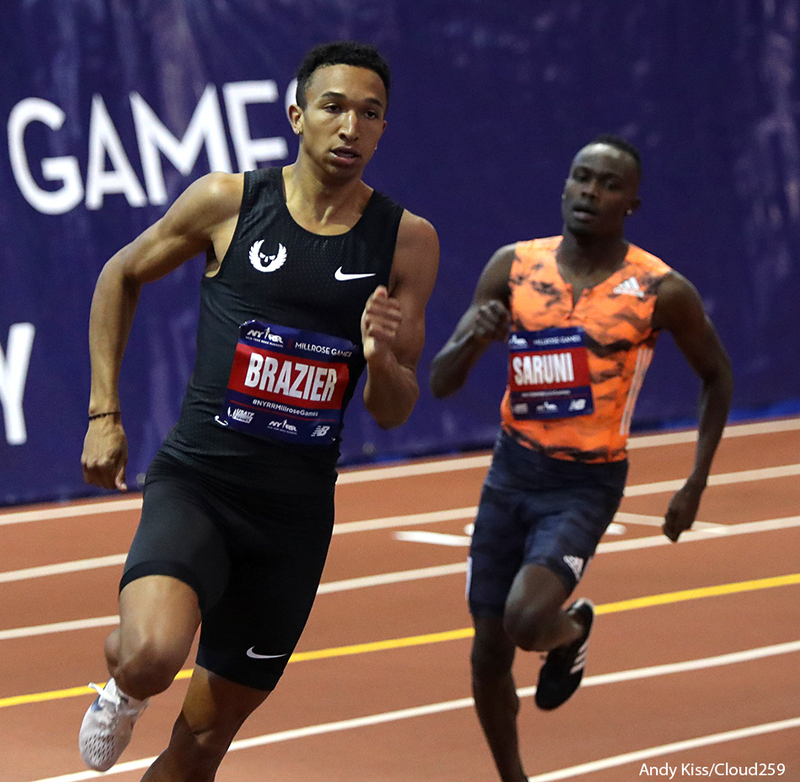 Speculation going into the men’s 800 centered on whether Donovan Brazier would beat the American indoor record of 1:45.00, set way back in 1982. 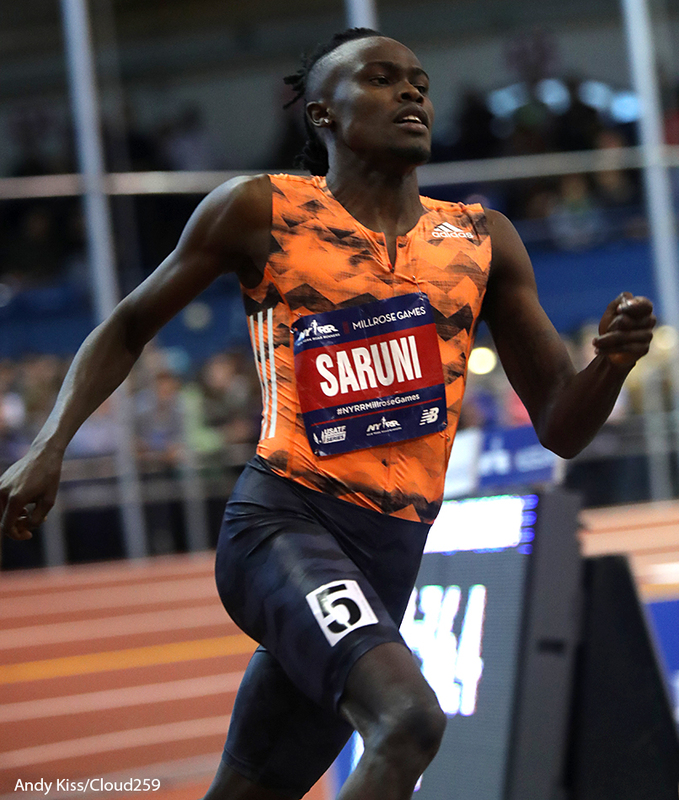 Brazier took it out hard with a sub-50 first quarter, but Michael Saruni was able to stay within range. Brazier got his record, running 1:44.41, but not the win, as Saruni, whose form late in the race brings to mind the raw speed and superhuman effort of Nijel Amos from the London Olympics, slipped by late in the race to run 1:43.98. The American indoor record went down in the women’s 800m race too, but here the leader, Ajee Wilson, held on to win in 1:58.60. 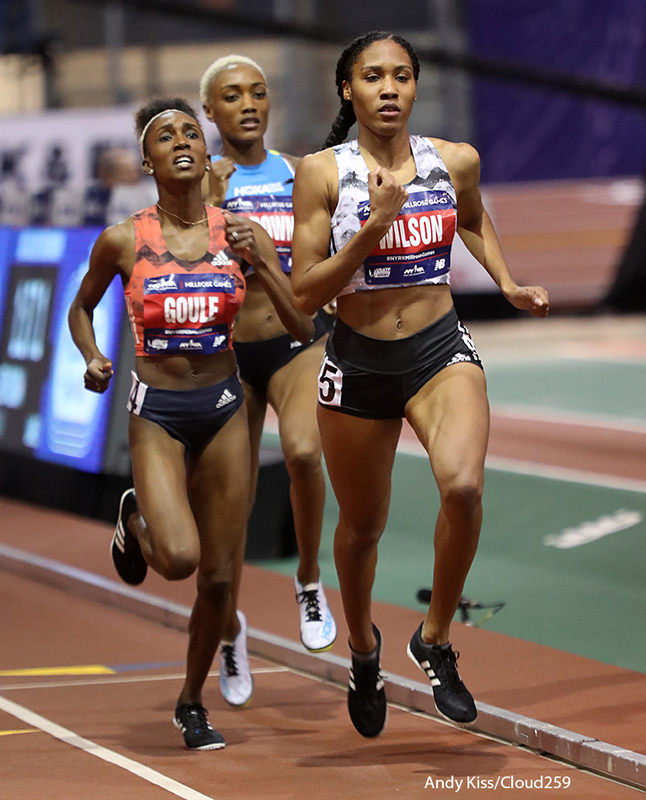 Running from the front is something Ajee Wilson has perfected with ruthless efficiency. She takes the lead early, it’s always close, and just when it seems she’ll be challenged, she simply stays in front. Rooting against her is like rooting against the Patriots. Natoye Goule, who beat Wilson once last year, gave a spirited chase but finished half a second behind. 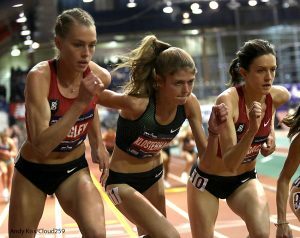 Germany’s Konstanze Klosterhalfen, the 21 year-old German phenom, gobbled up the rabbit quickly in the women’s Wanamaker Mile, passing her before the race was even halfway done. 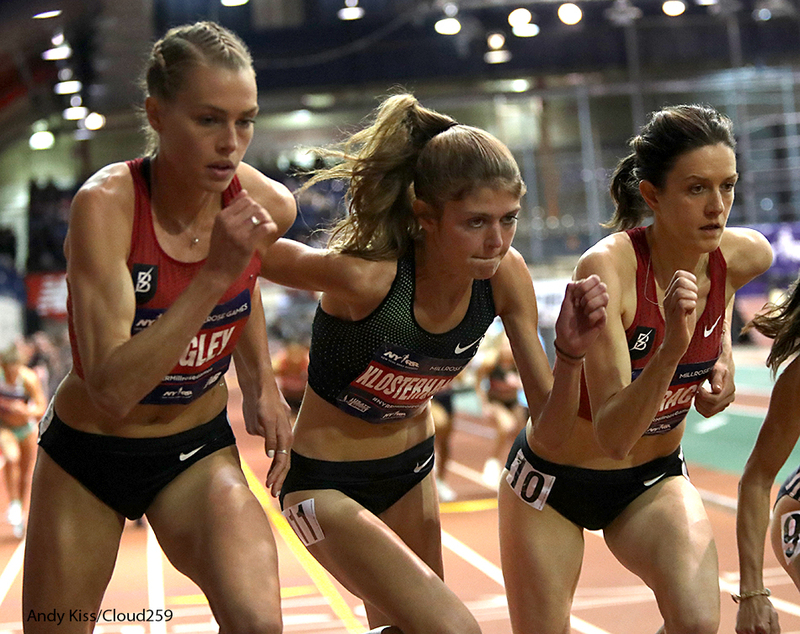 Last year’s top two Wanamaker Mile finishers, Colleen Quigley and Kate Grace of the Bowerman Track Club, led the chase, but “Koko” did to them what she had done to Jenny Simpson recently in the 5,000m, leaving them far behind. Given how Klausterhalfen, the one non-American in the race, has treated these Yankees, perhaps it’s time for the Americans to bring in the Houlihan. To attempt a distance-running world record is a high-wire act. It locked Yomif Kejelcha’s into a front-running strategy that could have made him vulnerable in the men’s Wanamaker Mile, given 3:49 miler Edward Cheserek in the race. 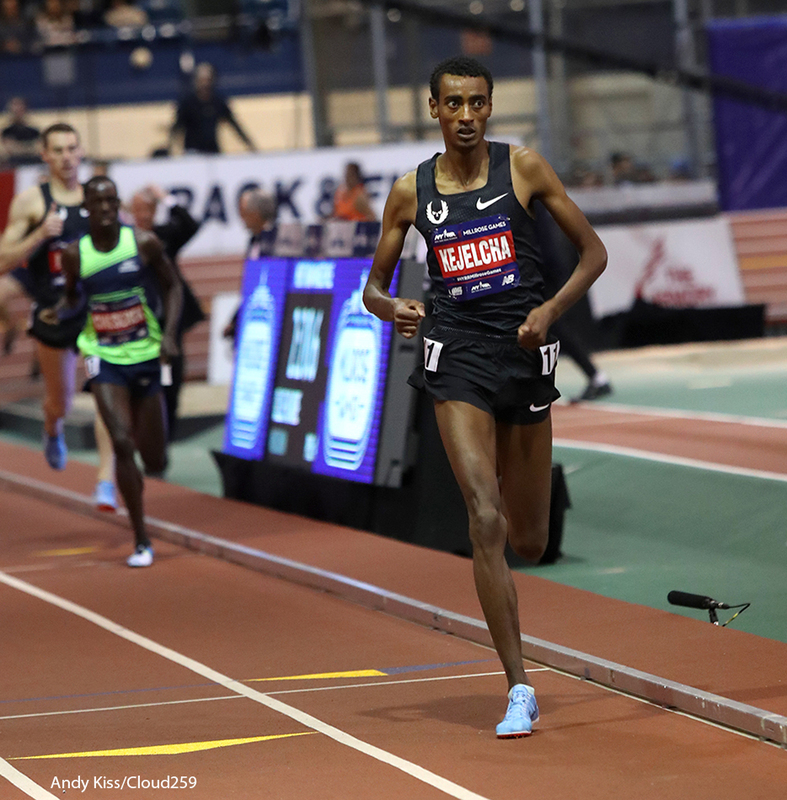 A telling aspect of Yomif Kejelcha’s meet-shattering record win in 3:48.45, one that left him just a hundredth of a second off Hicham El Guerrouj’s mark, was how he gapped not only Cheserek and Nike Oregon Project teammate Clayton Murphy, the two bold enough to try to go with him, but how he put the chase pack of extremely talented runners so far behind. Finishing second through eighth, with times ranging from 3:53.29 to 3:55.52, were Cheserek, Murphy, Josh Kerr, Craig Engels, Nick Willis, Ollie Hoare, and Johnny Gregorek. 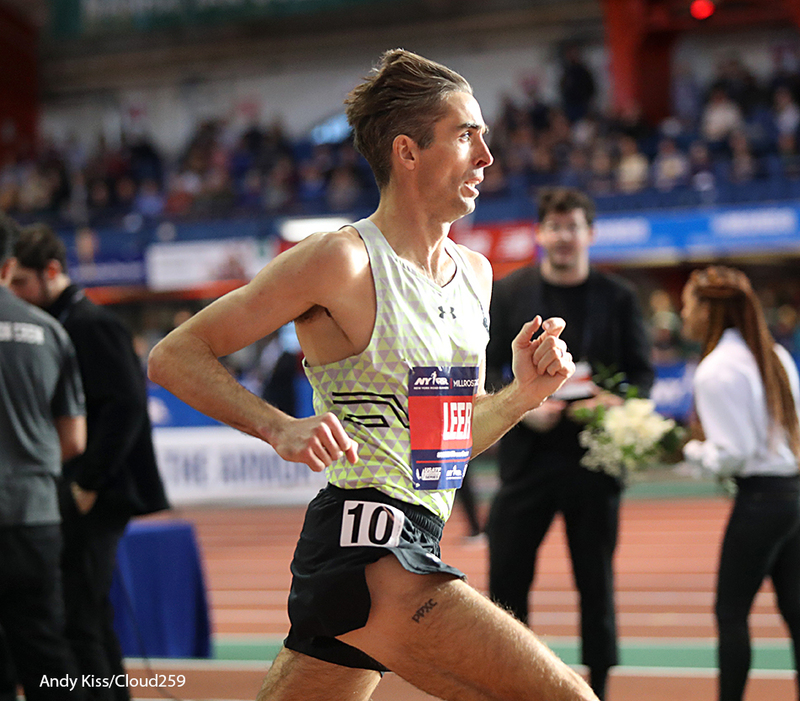 Defending Wanamaker Mile champ Chris O’Hare had a scheduling conflict, as he was running (and winning) at the British Indoor Athletics Championships. Considering what Kejelcha did, he probably was just fine with that.